You get an awesome social media management platform for your brand, that will make you a social media superstars. Get tons of benefits, and promote your brands on a daily basis to social media. 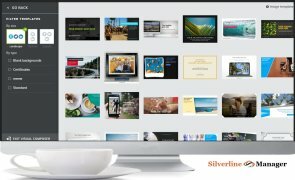 Schedule all your social posts for any time in the future, access a library of pre-prepared social content and create stunning visual posts with over 60 templates Use our stock photographs included in the platform to design your posts. There's also Hashtag Research, Content Research and much, much more to supercharge your use of social media. All social media interaction is in one place with a simple login and easy to use dashboard which works smoothly on desktop, tablet & mobile. Easily find relevant and engaging content, create high impact image posts with zero Photoshop experience and schedule it all in advance.